Every December ushers in new yuletide ballyhoo over the “correct” holiday greeting: Is it “Merry Christmas” or “Happy Holidays”? 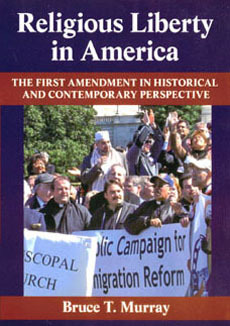 This dispute is emblematic of a larger Kulturkampf in America between “traditionalists” and secularists – often represented in lawsuits by the American Civil Liberties union. In earlier centuries, the debate over Christmas was entirely different. It turns out the celebration of Christmas was brought to America somewhat late in colonial history by German Lutheran immigrants and Catholics. The early American Puritans and Calvinists objected to the celebration of Christmas, associating it with "the sinister theology of 'Popery,'" noted Justice William Brennan in the 1984 Supreme Court case, Lynch v. Donnelly. The new University of Massachusetts Press book, Religious Liberty in America: The First Amendment in Historical and Contemporary Perspective by Bruce T. Murray, traces the origins of this and many other debates regarding religion and public life. Murray reflects on the deep rift in America between evangelical Christianity and the nation's liberal, secular consciousness. The book concludes with an analysis of the Supreme Court's evolution in its thinking about religious liberty since the late eighteenth century. Religious Liberty in America is available at libraries throughout North America and Europe, and it may be purchased from the University of Massachusetts Press.